Candace H. Johnson-For Shaw Media Averie Schultz,9, of Fox Lake makes a funny face at her fire hydrant called, “Magic Man,” with her mother, Carrie, close by on Grand Avenue in Fox Lake. Candace H. Johnson-For Shaw Media Averie Schultz,9, of Fox Lake checks to make sure her fire hydrant, “Magic Man,” is in good shape on Grand Avenue in Fox Lake. 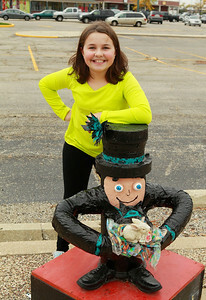 Candace H. Johnson-For Shaw Media Averie Schultz,9, of Fox Lake is all smiles with her fire hydrant, “Magic Man,” on Grand Avenue in Fox Lake. Averie used repurposed materials for her artwork. The bunny and shoes came from Goodwill. 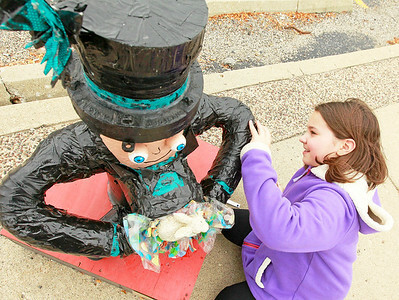 Candace H. Johnson-For Shaw Media Averie Schultz,9, of Fox Lake fixes the bow tie on her fire hydrant called, “Magic Man,” on Grand Avenue in Fox Lake. 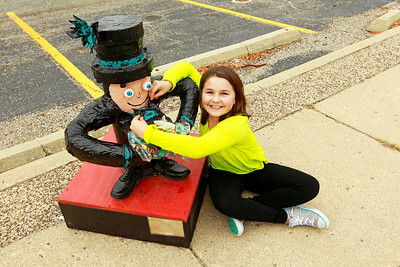 Candace H. Johnson-For Shaw Media Averie Schultz,9, of Fox Lake looks at her fire hydrant, “Magic Man,” and talks about the repurposed materials she used on him on Grand Avenue in Fox Lake. 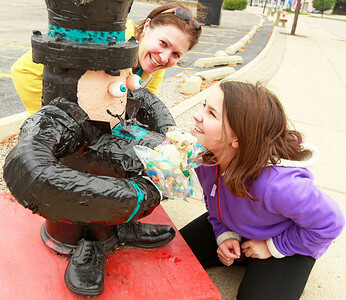 Candace H. Johnson-For Shaw Media Averie Schultz,9, of Fox Lake checks over her fire hydrant, “Magic Man,” as it sits on display on Grand Avenue in Fox Lake. 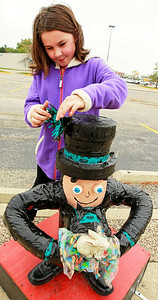 Candace H. Johnson-For Shaw Media Averie Schultz,9, of Fox Lake adjusts the bow on her fire hydrant called, “Magic Man,” on Grand Avenue in Fox Lake. Candace H. Johnson-For Shaw Media Averie Schultz,9, of Fox Lake with her fire hydrant called, “Magic Man,” on Grand Avenue in Fox Lake. Averie Schultz,9, of Fox Lake makes a funny face at her fire hydrant called, “Magic Man,” with her mother, Carrie, close by on Grand Avenue in Fox Lake.